“Infrared [detection] allows these guys, in pitch black, to hunt down warm-blooded prey,” said zoologist Bill Schutt, assistant professor at Long Island University, who was not involved in the research. Here, the researchers identified a modification in a common heat-sensing protein channel that lowered its temperature threshold so that it is more attuned to an animal’s body heat, he added. The common vampire bat was appropriately named after the myth of Dracula—it feeds at night and lives solely on a diet of blood, every day or two consuming up to half its weight in the vital substance from large mammals, especially sleeping livestock. The bats first use echolocation to detect their prey, but once they are within 20 centimeters of their target, they use infrared sensors in specialized pits around their noses to zero in on the best place to feed. In a previous study, physiologist David Julius at the University of California, San Francisco, and colleagues found that infrared detection by snakes—which, like bats, use nerves located in facial pits to detect their prey—is mediated by a cell-surface protein channel called transient receptor potential cation channel A1 (TRPA1). The channel is actually insensitive to heat in most organisms, but had evolved the capability in snakes, leading the group to suspect that a similar transformation may have given vampire bats their ability to sense infrared. 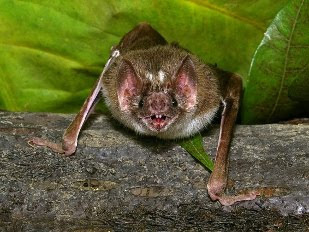 To see if this was the case, Julius and his collaborators at the University of California, San Francisco, the Venezuelan Institute of Scientific Investigation (IVIC), and the Carnegie Institution in Baltimore, Maryland, compared gene expression in vampire bats’ heat-sensing nerves, called trigeminal ganglia, with expression in a nerve cluster near the spine, called dorsal root ganglia (DRG). They also compared these expression patterns to those of the ganglia in four bat species that do not have infrared sensory abilities. To their surprise, they did not observe any differences in transcription of the TRPA1-coding gene, nor of any other genes. Instead, they discovered that the protein TRPV1—a heat-sensing protein channel normally triggered by temperatures over 43° C (110° F)—existed in two different isoforms—an approximately 850-amino-acid version and one that was 62 amino acids shorter. The short form, which resulted from alternative splicing of the transcribed mRNA, made up as much as half of the TRPV1 found in the trigeminal ganglia of vampire bats, whereas it comprised only a small percentage of the TRPV1 in the DRG. It was similarly low in both types of nerve clusters in the other bat species, suggesting that the short form may play a role in infrared detection. To test this hypothesis, the researchers expressed one of the two TRPV1 isoforms in human kidney cells and in frog oocytes grown in vitro, and measured their temperature sensitivity using calcium imaging and electrophysiological assays, respectively. As expected, cells producing the long isoform were activated at 40 degrees Celsius (104° F). Cells producing the short isoform, on the other hand, were activated at just 30 degrees (86° F)—a drop that allows the protein to respond to the warmth of the vampire bats’ prey. “This is a big jump in understanding how these animals locate their prey,” said Brock Fenton, a biology professor at the University of Western Ontario and author of an accompanying Nature News and Views article. While the longer isoform maintains its normal function of detecting potentially harmful high temperatures, the shorter isoform in the trigeminal nerves of the common vampire bat allows the animals to detect lower temperatures, such as the body heat of their mammalian prey. “Basically, evolution tweaked a system in vampires bats that was already being used to sense temperatures,” said Schutt, author of the 2008 book Dark Banquet: Blood and the Curious Lives of Blood-Feeding Creatures, turning it into a useful hunting tool. This is in contrast to the pit viper, whose infrared-sensing ability evolved from a different type of channel not involved in heat detection, but in the detection of noxious smells, added Fenton. The different evolutionary strategies employed by these two lineages “is an example of how plastic our sensory systems can be,” he said.